The current literature compartmentalizes the complex issue of water and wastewater into its discrete components; technology, planning, policy, construction, economics, etc. Considered from the perspective of sustainability, however, water in the urban environment must be approached as a single resource that can be continuously reused and recycled. This book will be the first to capture all of the current work on this idea in a single, integrated, plan for designing the water-centric cities of the future. 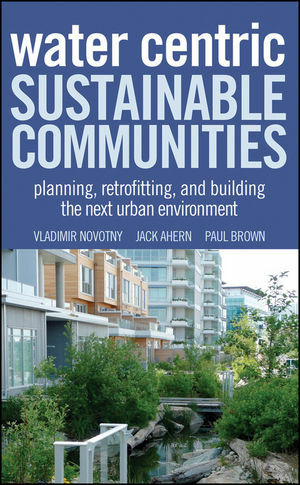 From new construction to the retrofitting of existing systems, this book presents the case for a new urban relationship to water, one with a more sustainable connection to the environment and the hydrological cycle. Through case studies of successfully planned and built systems around the world, the book will educate the reader about the need for a new approach to urban water management, and make the case that these changes are not only possible but imperative. Vladimir Novotny is Professor at Northeastern University in Boston, Massachusetts, and Emeritus Professor at Marquette University in Milwaukee, Wisconsin. He is also President of AquaNova, LLC. Jack Ahern is Professor of Landscape Architecture and Regional Planning at the University of Massachusetts in Amherst, Massachusetts. Paul Brown is Executive Vice President at CDM in Cambridge, Massachusetts, and is also Technical Director of the Neysadurai Centre for Integrated Water Resources and Urban Planning in Singapore.